Power Partners, Inc. offers a 200 watt medical, patient contact rated AC/DC power supply in their medical open frame/u-channel product line. 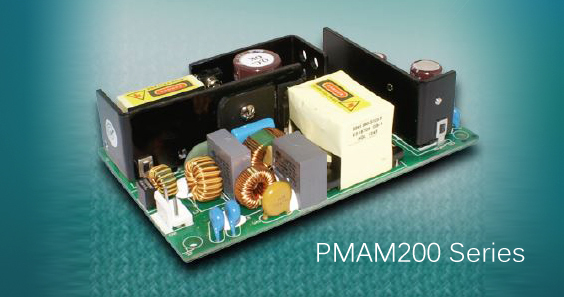 The PMAM200 Series is designed for 200 watts of power in a compact 3” x 5” footprint featuring a 90-264VAC input and single outputs of 12VDC, 19VDC, and 24VDC. There is an optional +5VDC standby and a remote on/off available. This series is BF (Body Floating) direct patient contact rated, with Class I and II inputs, and is certified to UL/cUL/EN60601-1 3rd Edition. Units are >87% efficient, 100uA @ 264VAC earth leakage or touch current, no-load power consumption <0.5W, operating temperature is -40°C to +70°C and MTBF >100,000 hours per MIL-HDBK-217F at full load and 25°C ambient. Additional EMC compliance includes FCC Class B radiated & conducted, EN55011 Class B radiated and conducted, and EN60601-1-2. The PMAM200 Series is ideal for use in a variety of medical applications intended for settings such as home healthcare/hospitals/office and labs where high power, yet compact size is required. The PMAM200 Series provides high reliability and energy efficient solutions with unit pricing as low as $83.00 in OEM quantities. Standard unit prototypes are available for delivery within 1–2 weeks, with normal production lead times 10-12 weeks ARO. Established to bring the best in class quality ac/dc power supplies and dc/dc converters to the North American Market, Power Partners offers thousands of standard ac/dc power supplies and dc/dc converters, coupled with the highest standards of customer service. Component Distributors, Inc. (CDI) is a value added distributor of high performance LED, power, rf & microwave, wireless and sensor component technologies. CDI distributes globally and provides local application support and customer service across the Americas. CDI delivers cutting edge power electronics by wrapping application support, development tools and design services around high performance products from industry leading manufacturers.